What did I think of it? What did the staff think of MY Miata? Let me tell you, using only the most professional of journalistic techniques, such as the bullet point and cell phone picture. Grand Touring, 6spd manual, appearance package and some tech goodies. 2018, stickers at $32,000. They ONLY had grand touring models. That makes sense because it’s what sells, but I was still disappointed to not get an LSD. Still.... The Ceramic soft top Miata above was certainly a looker and the guy helping me had no problem handing me the keys. He was new, not pushy, and genuinely a nice guy. Hope he does well here. Look at it. It’s gorgeous. The interior color matched trim bits look fantastic, the carbon fiber wrapped trim bits are understated—and at least with this color—look great as well. First time I’ve ever said that about fake carbon fiber. The shifter! Very short, almost zero play. Firm shifts, tight spacing side to side and fairly tight spacing front to back. Round ball on top of a metal rod, as all shifters should be. 60mph on flat ground in 6th gear I was at 2400rpm. That’s fantastic. Wish my Miata had a 6th gear for cruising. The seats get a lot of flak, but they’re not all bad. The seat heaters work amazingly, the normal heater is very strong, and everything is laid out well for an enthusiast car. Me likey. The clutch is perfectly average for a new car, which is to say that it’s objectively terrible for experienced drivers. Longish throw, super light, vague, no defined engagement point. Blah. You’d get used to it, but it’s a lletdown. I’m sure learning to drive stick on it would be simple though. Gas pedal. It’s hinged at the bottom, which makes smooth modulation a bit trickier if you’re used to just using the tip of your foot on the bottom 1/3 of the pedal. Can’t really do that here. Now, where that pedal shines in when you’re going full throttle and shifting at redline. Then it felt great. But for anything less... I wasn’t in love. Seats. Bolstering... Is nonexistent. Which I actu didn’t mind, but if you expect to do spirited driving or race, you will need an upgrade. Also, leather quality throughout is not great. I will say that the plastic they use inside is like a much better version of NA Miata plastic, which I like. Space. There’s none of it. Headroom specifically. My forehead was inches from the windshield surround, and I don’t think I would fit with the top up without crouching. Leg room is fine. Unfortunately the seat doesn’t lower at all.... Would definitely need to perform a foamectomy to sit down lower. Parking brake is on the passenger side. Just personal preference, but I like it on the drivers side! 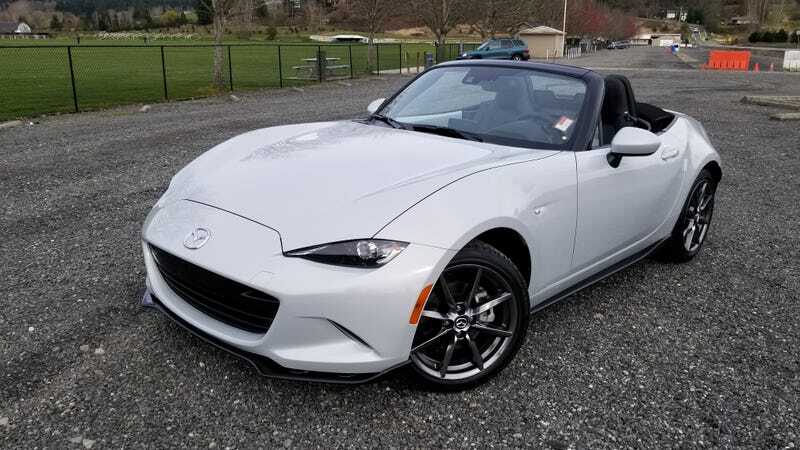 Steering wheel wasn’t great in hand, but the wheel I used last time I drove an ND was phenomenal so I imagine there’s a different one with the club Miatas. All in all it’s a fantastic car and I can’t recommend a test drive enough. It feels well put together, they have proven to be very reliable and simple to maintain, and it truly does put a smile on your face. What a fantastic throwback to the original. At $32k it’s a bit much, but A) it’s fully loaded top trim (minus the autobox) and B) dealers are willing to take off quite a bit. Oh and at least ten people came out of the tech and sales department to ask about my car, and tell me about the NA that they had, or are trying to buy/fix/mod. It was pretty cool. Going to a dealership and having people appreciate the time and work, instead of just seeing a beat up ricer.